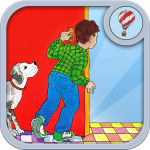 The award-winning storybook Doors, by Roxie Munro, is available as a lift the flap 3-D search iPad book. It is the second Roxie Munro app made by developer OCG Studios and created exclusively for the iPad. You can choose to read this book yourself, or be read to by the author. Find and animate over 90 little things and objects that are hidden behind doors, in drawers and in cabinets. Activate a multitude of funny sounds and increase childrens’ vocabulary by searching for objects that might be new words for them. Stimulate your kids’ curiosity with this fun search-and-find, lift the flaps book which is written in rhyme. Bank Street College Best Book of the Year Selection; Scholastic Parent & Child Best New Book. “…Children will pour delightedly over each detail. Never have the pleasures of discovery been more generously fulfilled.” Kirkus. “…From a barn to a space shuttle, all teem with the visual details kids love to get lost in.” CHILD magazine. “This is a book that’s sure to have kids lining up at your door.” School Library Journal.